When I first heard the name ‘FutureGrind‘, my mind was immediately flooded with images of a sci-fi-y Tony Hawk’s Pro Skater game, hoverboarding across the stars and such awesomeness. While that’s not quite what this game is, there will still be stunts and tricks aplenty as you flip and spin to pull off massive combos on… wait, floating rails? 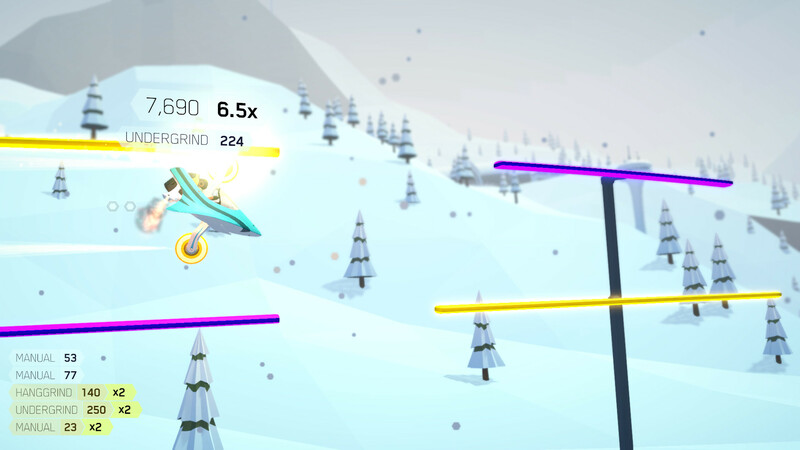 According to its creator, FutureGrind is “the future’s most challenging stunt sport”, which likely means players are heading for an ‘easy to learn, impossible to master’ experience in this one. This is perfectly fine, given its score-chaser focus, ya know? Or so it would seem, but amidst all the colorful 2D rails – that serve as grind spots for your groovy little bike – an mysterious presence looms, seemingly quite keen on getting your attention, no doubt for nefarious purposes. So much for a relaxing joyride on the right color (because… well, hit the wrong one and you’ll explode). Will you be able to keep that ominous presence at bay long enough to improve relations with various sponsors and unlock new bikes and tracks, or will you succumb to its dark lure? Do I even know what I’m talking about regarding the game’s hint of an eerie story? Heck no, because I haven’t played it yet! But take one glance at the trailer and tell me something doesn’t feel off. Way off. Then pick up a copy of FutureGrind to find out just what’s what, while pulling off those sweet moves. FutureGrind is available on Steam, Humble, itch.io, Switch and PlayStation 4.